Suspended Assam Pradesh Congress Committee (APCC) secretary Partha Pratim Bora on Thursday alleged that APCC president Ripun Bora has been leading the State Congress like a ‘dictator’. 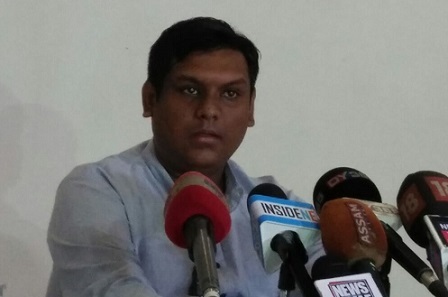 Partha Pratim Bora, who was a former Assam State National Students’ Union of India (NSUI) president, while addressing a press conference here, coming down heavily on Ripun Bora, alleged that the later has used the APCC as paternal property. The cancelled felicitation programme of students of Tezpur was organized by NSUI Tezpur district unit. Partha Pratim Bora further informed that he dashed off letter to CP Joshi and Congress president Rahul Gandhi on matter. Besides, Partha Pratim Bora asserted that the Assam Congress under the leadership of Ripun Bora would not be able to get 64 seats to form Government in 2021 Assembly elections and would also fail to win good number of seats in the 2019 Lok Sabha elections.